Follow an adorable little dust bunny on a quest to make a friend in this sweet and simple wordless picture book. Perfect for fans of Annie Silvestro's Bunny's Book Club. Dust Bunny is alone--and lonely. So when a small bug passes by him, he calls out hi and tries to befriend her. But the bug keeps on moving, and Dust Bunny sadly says bye. Then he meets a cat . . . but when the cat sneezes, the dust bunny goes tumbling. And so it goes, one failed attempt to make a friend after another. That is, until a broom sweeps Dust Bunny into the bedroom . . . and what does he find under the bed? Yes, his mates! This is a very simple, very sweet, incredibly spare story of missed connection and friendship, anchored by the cutest little bunny around. Amy Hevron is the illustrator of the upcoming picture book Trevor by Jim Averbeck. 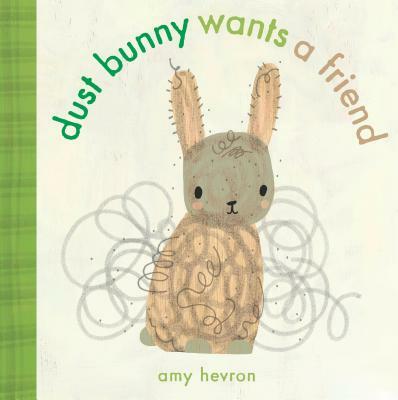 Dust Bunny Wants a Friend is her author-illustrator debut. In both 2015 and 2016, Amy received the Portfolio Honor Award from the Society of Children's Book Writers and Illustrators. Also a freelance illustrator and designer, Amy draws inspiration from wildlife, nature, and travel. Visit her at amyhevron.com or on Twitter at @amyhevron.